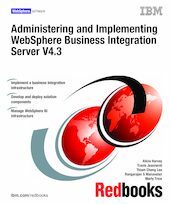 This IBM IBM Redbooks publication describes three major phases in a WebSphere Business Integration (BI) project. We discuss the planning and system design for a WebSphere BI infrastructure designed to support several business integration projects. - We extend the real-life scenario written for another book. Following planning and design, we discuss the implementation of the run-time engines available in IBM WebSphere Business Integration Server V4.3. - The next phase is developing and testing a business integration solution within our infrastructure. The integration solution combines three run-time engines of WebSphere Business Integration Server V4.3. These engines provide for human interaction, straight-through processing, and message brokering and aggregation. - The final phase of our WebSphere BI project involves deploying the solution into the production environment, and how to manage this solution. We address issues such as how to coordinate stopping and starting components, and troubleshooting run-time problems. We end by discussing performance tuning in WebSphere Business Integration Server V4.3.